While Tupperware may store leftover goodies, it has a bad habit of taking up too much space in the fridge and can give off a bit of an odd taste. You can resort to plastic wrap, but that stuff is a royal pain to mess with. If you want to have a Eco-friendly and reusable way to store food, why not use something made of natural materials? 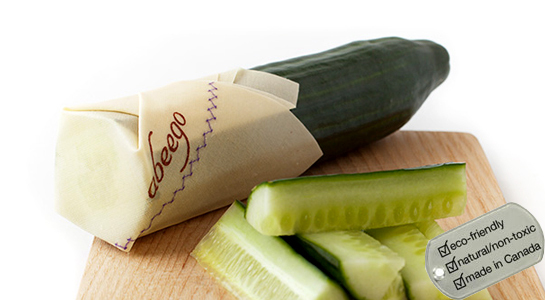 Abeego is a food-safe storage wrap that will keep consumables fresh and tasty. It’s a hemp and cotton cloth that has been infused with beeswax, tree resin, and jojoba oil. It is rigid when cool, but will become malleable and slightly adhesive at room temperature, so it will form to whatever purpose you need it for. Simply wash in cold water and Eco-friendly soap when it gets dirty. There are a variety of different versions ranging from snack wraps to large flats, which cost $11-25. If you’re ready to move away from plastics altogether, this is a good first step.